The descriptions that emerged of Foals’ new sound on their third release Holy Fire alluded to both experimentation and a smooth transition to the live stage. Interviews with frontman Yannis Philippakis saw words such as “swampiness” and “heat” used repeatedly; unsurprising given the setting in which Holy Fire was conceived. Recorded primarily live in a serene riverside location with mainly insects for company, the band even went as far as dropping any tracks which “didn't sound good in the environment.” Such strict resolve is not only commendable but is excellent news for fans who are already accustomed to their energetic, visceral live performances. 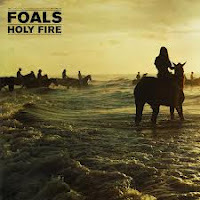 Holy Fire is more experimental than Foals’ previous releases and it covers more ground than the winsome Antidotes or the progressive Total Life Forever, as it creates a bridge between their début and their sophomore release whilst also exploring new territory. Some of the strongest moments on Holy Fire emerge when Foals recall the bouncy, playful riffs that permeated their début release and incorporate them with the mature song-writing demonstrated on Total Life Forever. Lead single “Inhaler” sees a typically strong lead riff built upon patiently, until the tension is relieved amid a wall of crunching guitars, before quickly softening and allowing the process to begin all over again. Upon comparing the measured “Inhaler” and the relentlessly enthusiastic “Balloons” we see not only an evolved song structure, but a natural progression that touches upon elements of both Antidotes and Total Life Forever; demonstrating their ability to marry energy with maturity expertly. Holy Fire's pitfalls occur at both the beginning and the end of the album. Coming from a band who penned the measured brilliance that was “Spanish Sahara,” the anti-climatic album opener “Prelude” is as much a surprise as it is a disappointment. A gradual build up never fully convinces in its attempt to set up “Inhaler,” whilst it also isn't strong enough to be viewed as a standalone track. The similarly underwhelming “Moon” drifts on the back of delicate picking and a light synth line, but fails to develop into the fitting album closer it threatens to be, as it looks to emulate the formula on “Stepson” but instead falls slightly short. The fact that these are the only minor issues on Holy Fire is testament to its ambition and quality, and with the band's UK tour selling out within hours of going on general release, Foals’ growing popularity is only eclipsed by the strength of its blossoming discography.